Sony Xperia 1: "Alpha doesn’t want to give Mobile certain things"
What seemed like the most obvious strategy in the world – Sony implementing its world-class Alpha camera technology in its underperforming smartphones – is finally starting to happen, beginning with the Sony Xperia 1. 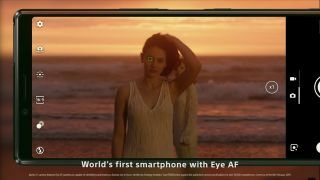 The Xperia 1 will be the world's first smartphone with Eye AF, which has been used to great effect in cameras like the Sony A6400. In addition, it will also feature 10fps with AF/AE as well as Raw shooting. So why didn't all this happen before? According to Adam Marsh, Sony's Senior Manager of Global Marketing, it was due to the structure of the company under previous President and CEO, Kaz Hirai (who rose to power from the company's PlayStation division). With the change in leadership last year, some company restructuring took place: Sony's Mobile division is now under the same umbrella as Imaging, with Alpha's Kimio Maki heading up product development. However, the departmental segregation may not have entirely eroded. “Even though we’re one company, there are still sometimes barriers that Alpha doesn’t want to give Mobile certain things, because all of a sudden you have the same as what a £3,000 camera’s got. It's about time that Sony's stopped divisions stopped competing with themselves, given that their real competition are the Huaweis and Samsungs of the world. The sooner it leverages the full weight of its Alpha team, the sooner Sony Mobile can become a true force.